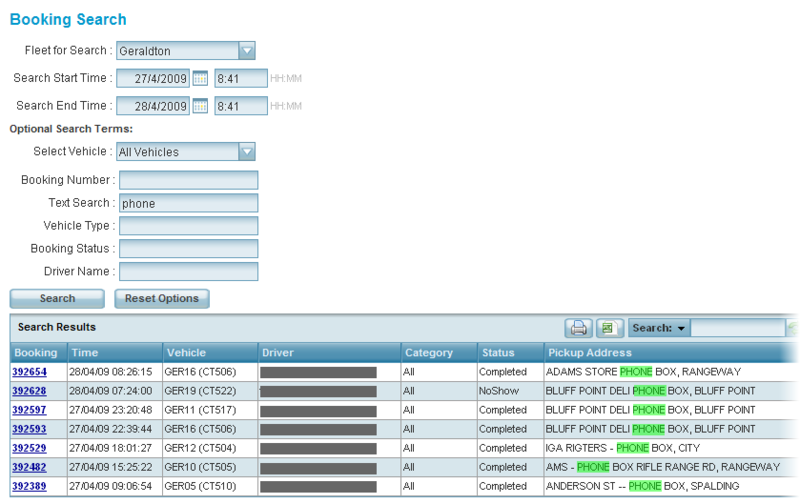 This report is used to find the bookings that match various fields. 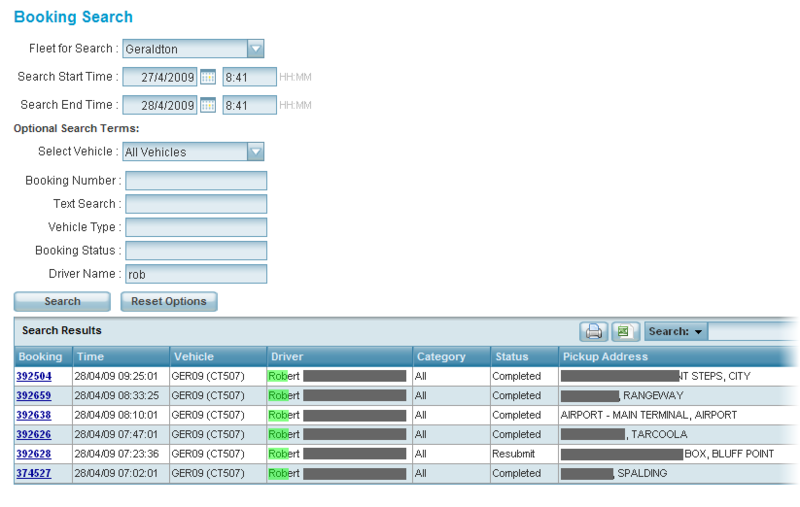 Select the fleet (1) to be searched and then select a start and end date and time for the search (2). If left blank all vehicles will be included. If a booking number is entered only that booking is listed. If you are interested in a single booking you would normally use the Booking Details report. If anything is entered here the booking will be listed if the text appears in any of the following fields: passenger name, pickup or destination street or suburb and phone number. Can be one of ‘completed’, ‘resubmit’, ‘noshow’. The driver has registered for cover work. If anything is entered here the booking will be listed only if the driver’s name includes the text entered. Thus if ‘Rob’ is entered ‘Robert’ and ‘Robbie’ will both match, but ‘Bob’ will not. Press the Search button (3) to start the search. The bookings that match the search fields are listed. Press the Search button to start the search. 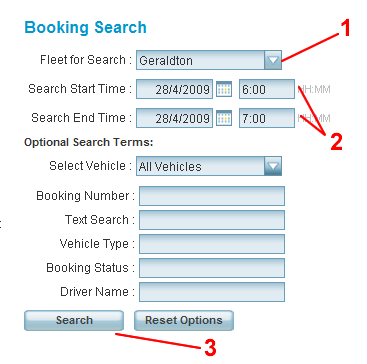 The bookings that match the search fields are listed. The booking number. Click on the number to get the booking details report. The date and time. For pre-bookings it is the requested pickup time; for ‘asap’ bookings it is the time of booking; and for ‘hails’ it is the meter on time. The vehicle category. The word “hail” appears for jobs done without a booking. The final status of the job. Normally the word “completed” appears but resubmitted work may also be shown. The pick-up address. The word “hail” appears for jobs done without a booking. Note: a maximum of 50 bookings are listed. The following search looks for any booking done by a driver who’s name includes ‘rob’. The following search looks for any booking at a phone box.